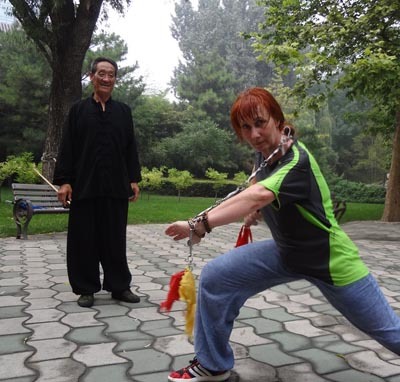 Just a quick update to let you know my training in Beijing is going well. I have my own (very small) room in a cheap hostel. I had to laugh when I saw my 'home' for the next month - Basically you open the door and clamber onto the bed and then shut the door! But it's not a problem, the room is adequate and clean and the graffitti is somewhat amusing. Every morning, I rise at about 5.30 and walk to a nearby park. I buy a tasty eggy pancake (20p) from a street vendor to sustain me through morning training. Arriving shortly after 6am, I practice roughly an hour each of Qigong, Taiji & Shaolin Quan until 9am, then i'm off to Mandarin class for 3 hours, two subway stops away. I tried walking it once, but after nearly ending up as a red streak on the tarmac of the inner ring road i decided to opt for the subway. Back at the hostel, after an hour's siesta I do a little book study in my room and then go back to the park for about 3-4pm where I stay until about 8-9pm, including a workout in the outdoor gym and some time spent in meditation beside the lake. Occasionally I take a nap on a park bench, much to the amusement of the locals, but sometimes i'm so exhausted and the hostel seems a long way away, so if the mozzies will leave me alone long enough to snooze, that's what I do. 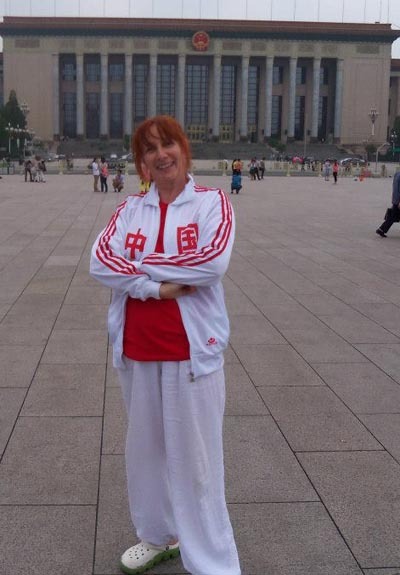 I have met several local Tai Chi & Kung Fu practitioners who have warmly invited me to join in with their practice. A morning group are teaching me a Wudang Yang Shen Gong (Health Preservation) exercise set, which i'll teach to my Qigong students when I return. I've also been going through the Beijing 24 with them every morning (unsurprisingly considering where I am) and i've picked up a few revisions on that. When they ask who my teacher in UK is my answer is met by raised eyebrows and nods exclamations of approval. It seems everyone knows of Master Wang Hai Jun! 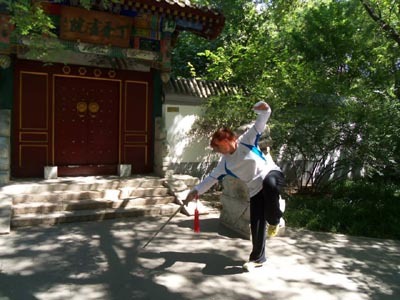 Pic: Cherry takes a break from Tai Chi and joins in with some local Beijingers' Kung Fu practice - Nine section whip. 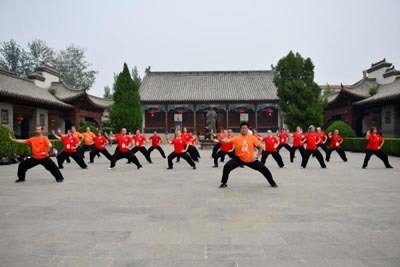 I've been 'adopted' by a Shaolin Kung Fu group who are making me mega-fit with their basic exercises and form work and some weapons training. I just stopped one day to watch, inevitably got chatting and next thing I knew I was handed a weapon. The rest is history, haha! They are so enthusiastic and friendly and training with them is so much fun that it's really hard to say 'No'. When they think this old 'Laowei' has worked hard enough (usually about the point where I stagger around like a new-born foal) my Martial Atrs family will insist I sit in the shade for a while and they find something in their bags for me to eat , encouraging me with kind words of how well I did. Aw, they are so lovely! One of the ladies made me a gorgeous wooden bead bracelet so I will remember them all when I leave Beijing. 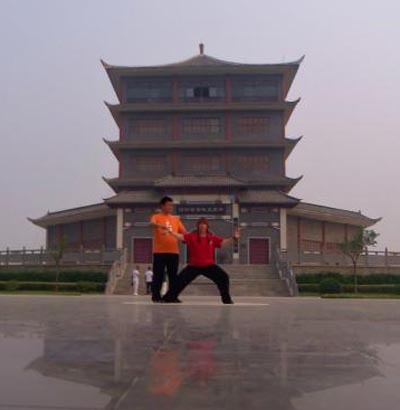 But of course, the Qigong and Shaolin training is just for fun and only takes up a little of my training day . 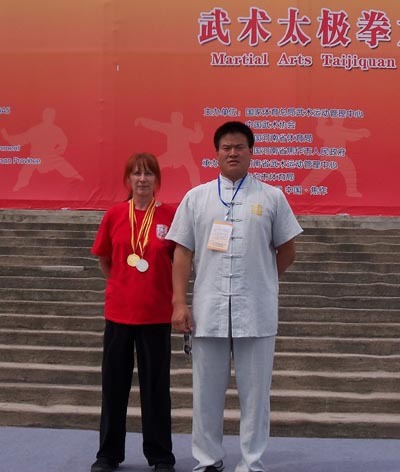 The main focus of my practice is the Chen Taiji forms which i'll be performing in under a month's time at the Jiaozuo International Taiji Competiton. As well as practicing forms I take a few movements each day and analyse Master Wangs DVD on my laptop, read through Chen Zhenglei's book on the corresponding forms and then practice them until they feel right. It's about 33-38 degrees here most days, and about 28 at night, so I'm getting through 4-5 litres of water a day in my training sessions. Actually, training starts on the way to the park when I buy the water and put it in my backpack, haha! Some evenings I finish training early and get a Tuina massage - afterwards I feel absolutely great. August 14th: I haven't trained for a day and a half. I've got a head cold which is making me feel exhausted and dizzy. I've decided to go to the massage place next to the hostel tomorrow for a Gua Sha treatment. I had Gua Sha once in 2009, which was given by the masters at a martial arts school I stayed at in Shandong and I remember it with aversion, but it killed the cold almost immediately. I'm worried that the clock is ticking down on my training time before the competition and I can't afford to take time out of training. August 15th Well it wasn't pleasant, but was over in less than 10 minutes and only cost £2. Apparantly it's the oldest surviving treatment for a common cold known to man, so it must have some credence, right? As instructed I've eaten some ginger and drank some green tea, and had a bit of a snooze. LATER: Whoohoo! 6pm and I feel great, apart from a sore back.... The sinuses have cleared and my energy has returned. I still feel a bit off-colour but I'm going down the park for a gentle training session. Sorry for the gap in comms! I've been training as much as possible and I have just spent the last 5 days in Jiaozuo at the 7th International Taijiquan Competition. I am now travelling with a group of 23 of Master Wang's students from around the world - China, N & S America and Europe. Eight of us were entered for the competition and we won 13 medals between us. One gold, 8 silver and 4 bronze. I am happy with my results - a silver medal for my sword form and a gold medal for my empty hand form. The best part of this week has been performing on stage in front of Grandmaster Chen Zhenglei, bright lights, TV cameras and a large crowd. Master Wang led our group in Laojia Yi Lu. The atmosphere was amazing and I didn't feel a hint of nerves. I just keep reliving that moment over and over again - suberb! Whilst staying in Jiaozuo, we paid a visit to Chen Village. It was touching to see where my teacher studied with his teacher, Chen Zhenglei and to hear about the hardships of life in the Village back then and how the tradition of Taijiquan was preserved for future generations by these diligent and incredibly self-disciplined masters. 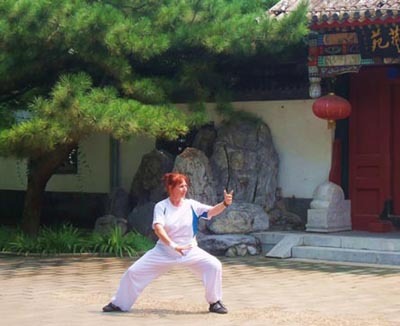 Master Wang took some time off showing us around to practice some form with us in three different locations in Chen Village. We also looked around the new Chen Village Taiji Museum - a tribute to the forefathers of Taijiquan. We visited the house and courtyard where Master Wang lived and trained with his teacher and met a couple of the neighbours, who remembered Master Wang. Master Wang spoke about training with his teacher and how, as a youngster of about 11 years of age, just arriving in the village he was unable to understand the villagers' local diallect for quite some time. Next, the absolute cream of my trip to China. Three more sites in Chen village which really touched me. Master Wang led us along a disused track and through an overgrown area to visit Chen Zhenglei's old house which is now in ruins - a house Master Chen built himself from free materials such as compacted earth mixed with straw, tree branches and thatch, because he couldn't afford building materials such as bricks and mortar. Master Wang told us that despite working very long hours, enduring the poor living conditions and regular lack of food, Master Chen would never neglect his daily practice of Taiji. Master Wang said that Grandmaster Chen lived according to the principle of Chi Ku - or 'eating bitter' which means to endure hardships without complaining, developing character traits such as patience, endurance, diligence and perseverence through hard times in order to master an art or reach a goal. 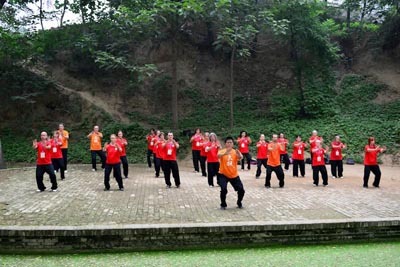 Grandmaster Chen Zhenglei certainly has this quality and as such should stand as an example to all who train in Taijiquan. About four years ago, I had read about this concept and it had stood out at that time as something I really wanted to achieve, to aspire to: To be more disciplined and have a stronger determination when things were uncomfortable rather than take the easy route and just wimp out. I had just started Taiji about a year before so I decided to get a small tattoo on my ankle with the characters Chi Ku. 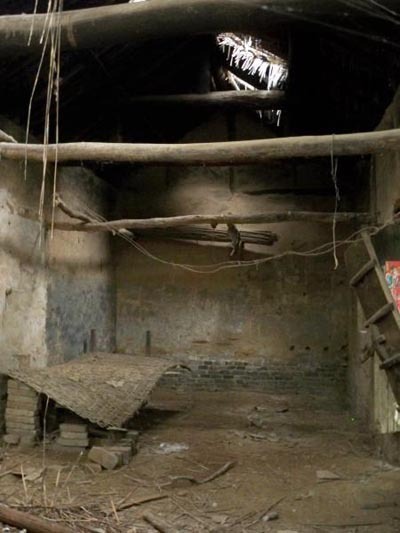 But there, standing in what remained of Chen Zhenglei's old house with its mud walls and straw roof, built by his bare hands and copious amount of sweat, and as I listened to Master Wangs weighty words, I really understood what Chi Ku meant. After visiting Chen Zhenglei's old home, we paid our respects at the grave of Chen Zhaopei, Chen Zhenglei's teacher who restored Chen Taiji to it's former glory after the ravages of war between the communists and nationalists had seen the practice of taijiquan decline in Chenjiagou. He threw open his doors and provided free training for anyone who wanted to learn. Additionally, during the Cultural Revolution, Chen Zhaopei had been persecuted for practicing Taiji to the point of throwing himself down a well to (unsuccessfully) commit suicide after repeated public struggle sessions. Even so, in secret, at night, he would continue to train his students including Chen Zhenglei in the skills of Taijiquan, despite the great risk of harm to himself, should he be discovered. Such was his passion for Taijiquan. This was such an emotional time for me. 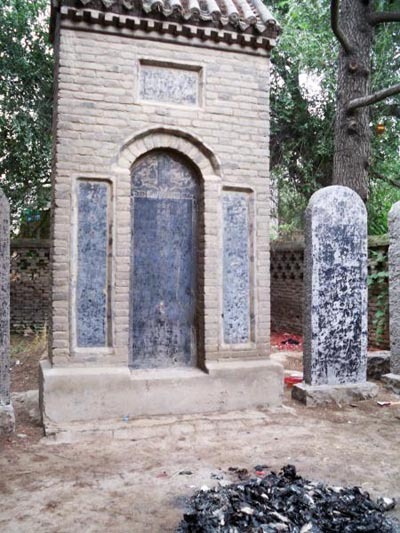 I stood in front of Chen Zhaopei's grave, it hit me not just in my head, but in my heart, just how much the previous generations of Chen Taiji Masters had to endure and yet still had the strength to practice faithfully through sorrow, loss, pain, drought, flood, famine and war. The last stop on our tour of Chenjiagou was the valley where Master Wang trained for thousands of hours both as a boy and a young man. At the entrance to the valley from the far end of the Village was a well which supplied Chenjiagou with it's magical water. Master Wang told us of a saying about the water: "He he chen guo shui, dou hui qiao qiao tui". which loosely means if you drink the water of Chenjiagou your feet will know how to kick, or you will get good Taiji skills. Needless to say I scooped up the cool refreshing spring water and gulped it down! Master Wang showed us the footpath up a hill where he would run to training in the valley several times each day from Chen Zhenglei's house, just over the brow of the hill. He told us that training in the valley in the dark was very special - it was often so dark you couldn't see your hand in front of your face, apart from when the moon was full. He spoke of a special air in the valley, and I could certainly feel what he meant, a heavy ,rich, pure cool quality. It was such a special day. Chen Village is hallowed ground and to be told it's rich history, personally , by my teacher Wang Hai Jun, as we visited the places of his youth, made it all come to life for me, as if i was living it too! Sadly we had to leave Chen Village behind but also on the itinerary before heading further south were Shaolin Temple and the grottoes at Longmen - both wonderful cultural sights steeped in history. Next stop, Wudangshan. I'm pretty excited about this. I was there in 2011 and I loved the remote temples and hidden footpaths so I can't wait to explore again. I also hope to find the Taoist teacher whom I stayed on the mountain with a couple of years ago. He's since moved, but I hear he's still up on the mountain so I hope I can ask around and find him, with my limited Mandarin. Well the time has gone quickly. We had a few days in Wudang - 2 days touring with the group looking at the famous sights and one day when I took some time away from my travelling companions and went up the mountain alone. I found my old Taoism teacher after some searching and we celebrated our friendship, peacefully and quietly with a cup of boiled water at a plain wooden table I love this about the Taoist way - no frills, no unnecessary nonsense or compulsory polite chit chat, just a genuine care for one another and just the bare necessities of life. After Wudang we headed further south to Zhangjiajie and visited the scenic Karst mountains and caves of the region. Again, fairy tale scenery - The inspiration for the movie Avatar came from here. 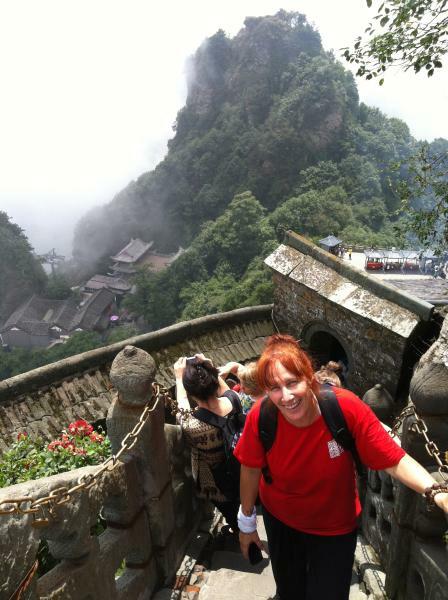 Lots of steps to climb, lovely food, good company and Tai Chi. What a trip! 3.9.13 Now we are back in Beijing and will be visiting the Great Wall and Tian'anmen square plus Forbidden City. And more training, of course! It has been a wonderful trip - a bit too hectic and fast at times for me but certainly exciting. Or maybe i'm just getting too old for all this travelling!